A Purana is a sacred text. 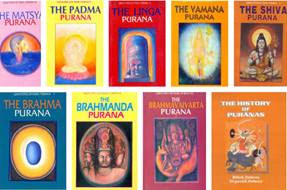 There are many Puranas. It is believed that Vedvyasa or Krishna Dvaipayana had written them. The Puranas together make one crore shlokas. Since this number was too much for mere mortals to read, he summarized it to 4 lakh shlokas. The truth is that no one person wrote the Puranas. Many people wrote them. The eighteen main ones are the ones that Vedvyasa wrote. Puranas are divided into three categories. They are satvik (puranas that glorify Vishnu), tamsik (puranas that glorify Shiva) and rajsik (puranas that glorify Brahma). The Puranas have many stories in them. Most of them are related to the Ramayana and Mahabharata. They also have new and different stories which I have not heard or read them before. Bibek Debroy has translated the Puranas to English abridged versions. Each of the versions have a particular part of the Purana as it would be very tough to give the whole version. They are short and easy to read. I find it very easy to understand as they use simple English. I have also reviewed these abridged versions. So far, I have read and reviewed 13 puranas. They are on my blog. I enjoyed reading the Puranas and look forward to reading all of them.